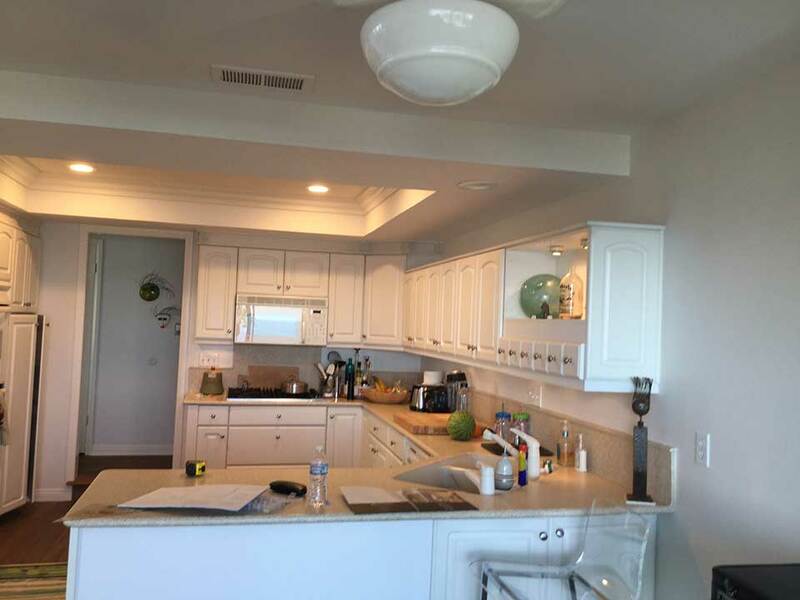 Before the kitchen redesign of this home in San Clemente, the first thing you would notice were the spectacular ocean views. It was a beautiful space, in terms of the views, and from the glass doors across from the kitchen bar, you felt as if you in an oceanfront resort. Unfortunately, the design of the kitchen itself didn’t reflect a similar sense of beauty and luxury. 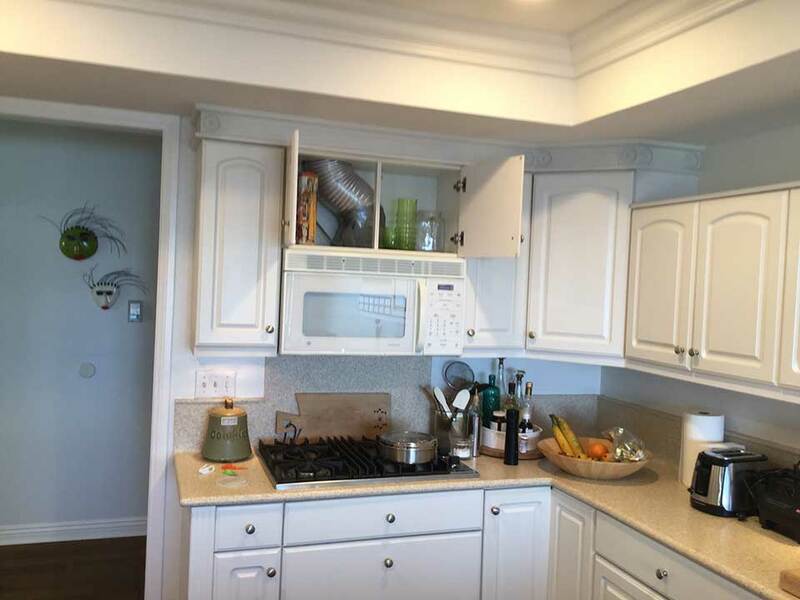 One of the biggest problems in the kitchen design was the cabinets. They were outdated, with a traditional single-panel inset design. 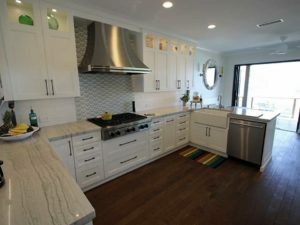 The cabinets not only lacked originality and dated the entire kitchen, but they also had add features and gaps that could have been used for storage, yet went unused in the previous design. 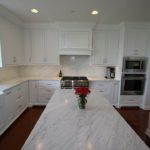 The kitchen countertop was a cream color that felt inexpensive and similarly dated, and the overall design and finishes found in the kitchen simply didn’t reflect the beauty and luxuriousness of the views afforded by the placement of the kitchen. The before design also featured a dropped ceiling, and a kitchen sink that was set in the corner, which seemed to obstruct the workspace and limit the overall counter space. Adjacent to the kitchen was an area that was largely under-utilized in the previous design. There was also an odd pony wall between the kitchen and living area that felt obstructive and unnecessary. 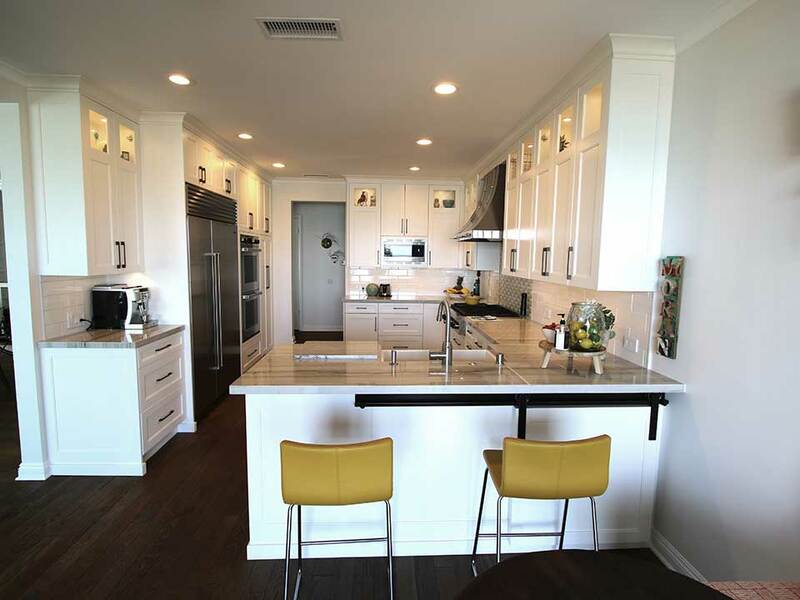 The goal of this San Clemente kitchen redesign and remodel was to create a space that felt updated, stylish, elegant and also worthy of the stunning views that define this home. First, the ceiling was raised and designed so that it was all level, removing the dropped ceiling that created a feeling of less space. With the higher ceilings, the kitchen already felt grander and more open. 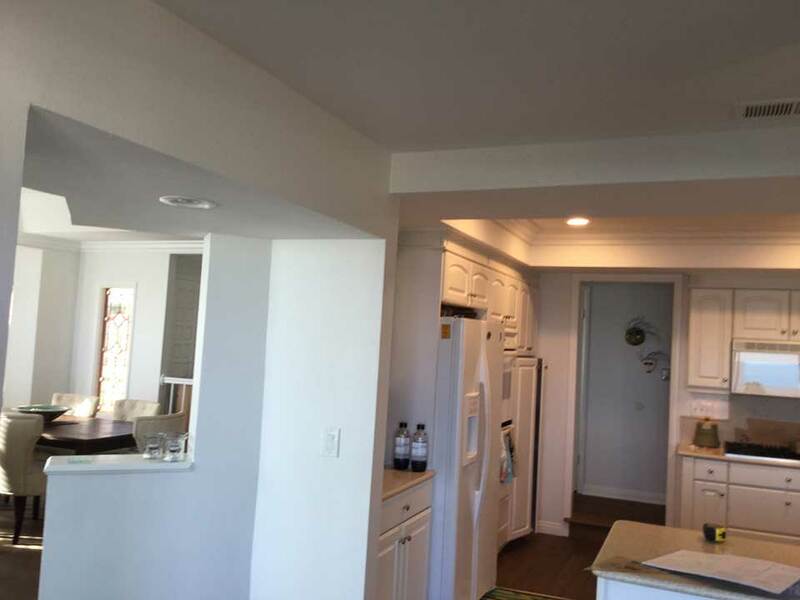 The pony wall was also removed, and the overall layout of the kitchen became a U-shape, rather than the angular design previously found in this San Clemente kitchen. This Orange County kitchen design focused not only on incorporating custom cabinetry and high-end finishes, but also maintaining clear sight lines to maximize the ocean views. 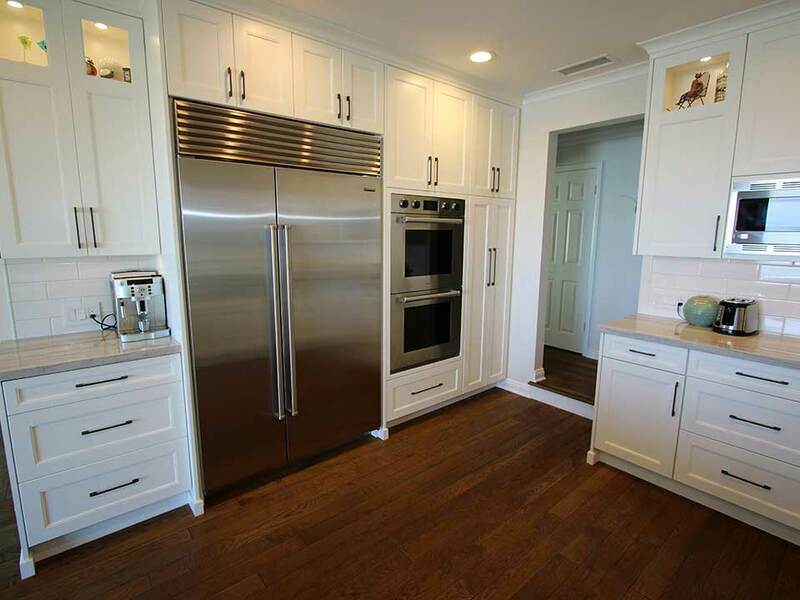 The kitchen cabinets designed and built by APlus feature a Craftsman door style, with Sonora molding. The upper cabinets feature some faux glass doors, and the cabinets are constructed of maple with a Pure White finish. 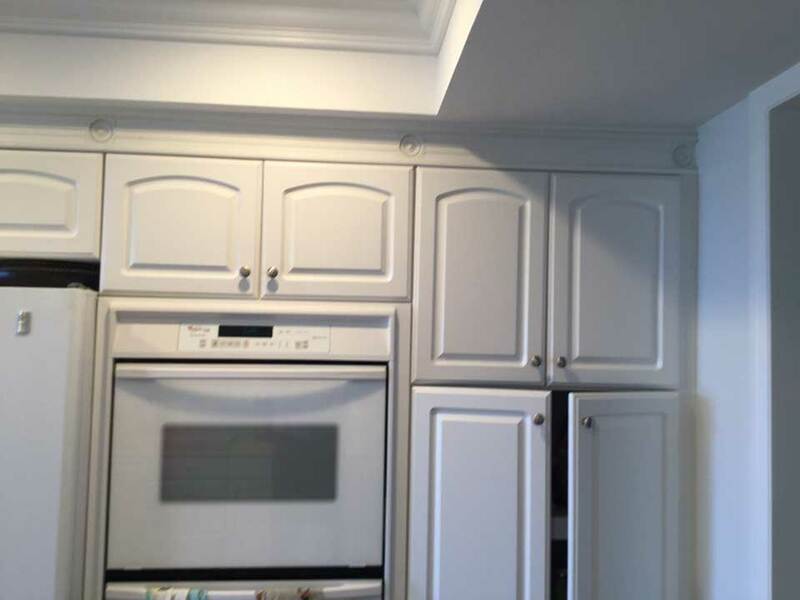 The cabinet design also includes 3 ½-inch cove crown molding. 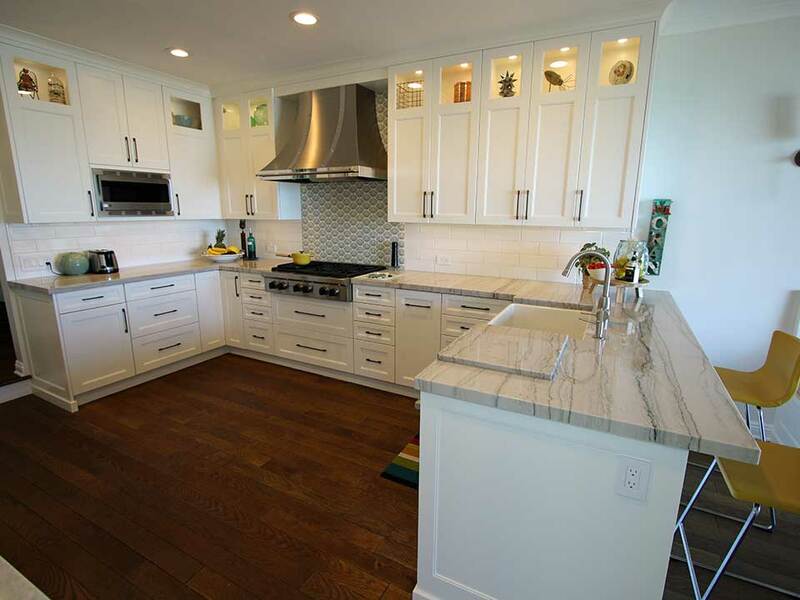 The countertops feature slabs of gray and white quartzite, with a sleek, streamlined 1 ½-inch square mitered edge. Behind the range and stainless steel hood there is a unique feature, which is a custom backsplash created with dandelion-patterned tile. 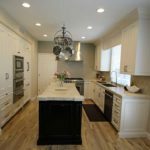 It adds a bit of visual distinction and contrasts with the fresh, white subway tile backsplash that surrounds the perimeter of the rest of the kitchen. Dark hardwood flooring adds just a bit of traditional elegance to an otherwise relatively modern kitchen. An expansive farmhouse kitchen sink was placed so that it offers direct views of the ocean. Adjacent to the kitchen a built-in banquette was added, to infuse more seating than just having the bar. Also added was a custom wet bar area, with a prep sink and additional storage. Appliances included in this high-end San Clemente kitchen remodel include a 48-inch SubZero refrigerator, a 36-inch Wolf cooktop, and a Native Trails prep sink. There’s also a Kings Bottle beverage center and a stainless steel canopy hood over the range. 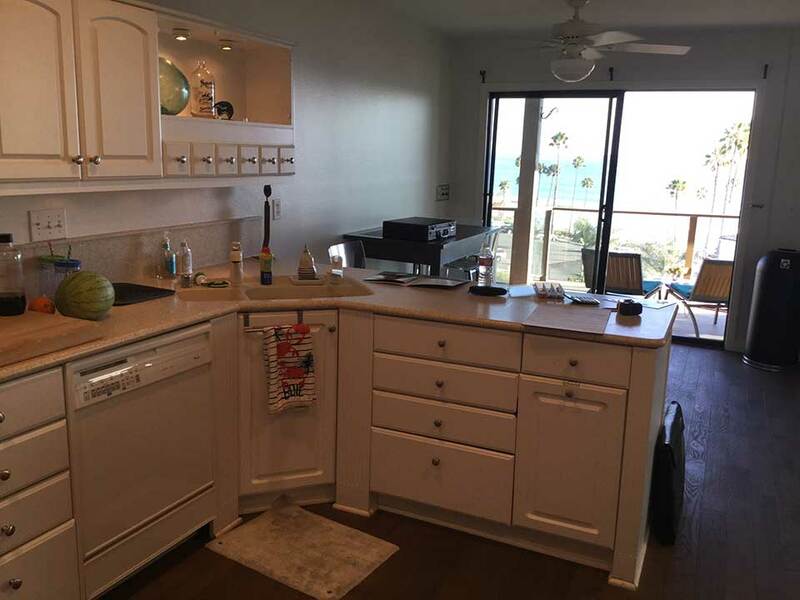 The overall look of this San Clemente kitchen is now one that’s completely custom, luxurious, and still takes into account the importance of the view. 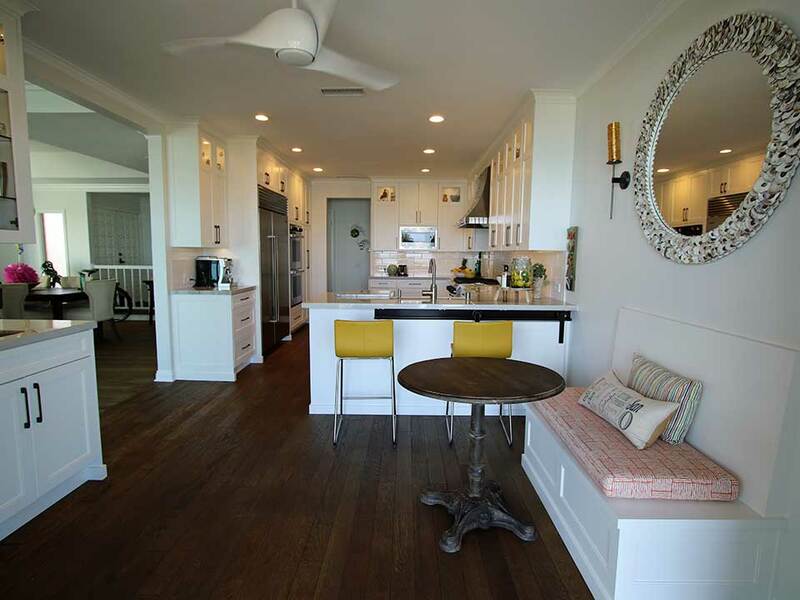 It makes a perfect place for entertaining, or simply relaxing and taking in the ocean laid out before you.